In the early 1820s the exclusive Bond Street neighborhood which was becoming home to eminent New Yorkers with names like Roosevelt and Astor. Just one block south, in 1822, a two-and-a-half story Federal home was constructed for Stephen J. Brinkerhoff. Located at No. 11 Bleecker Street it was clad in Flemish-bond red brick trimmed with modest brownstone lintels and sills. The project was apparently purely speculative, for in 1823 the property was transferred to Henry Remsen. Remsen was well-known in New York as a wealthy merchant from a long-established family. He quickly turned it over within the year to John Culbert, who took title in 1824. The Culbert family would retain possession of the house for years. The title was passed to William A. M. Culbert in 1862,. It appears that they leased the residence rather than living there. In 1837 physician Abraham D. Clement was listed in New York City directories as living here. By 1841 another doctor, Joel Foster, had taken occupancy. Carter was born in France on March 25, 1819 and married Elizabeth Perces Brooks around 1845. 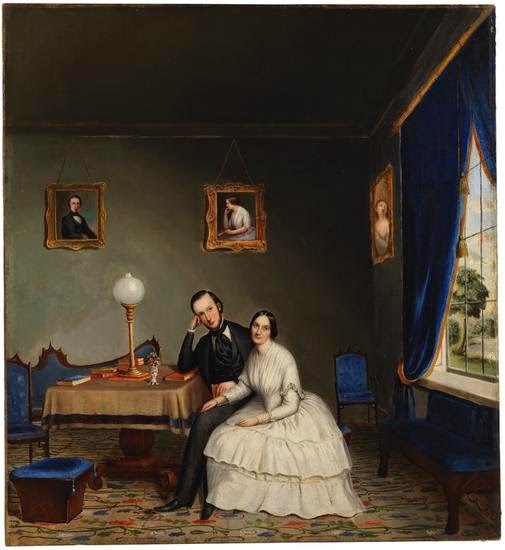 The couple moved to New York City by 1848, around the time the painting was executed. The Carters’ address was on Carroll Place (a one-block section of Bleecker Street further west at Thompson Street) in the 1853; then at No. 123 Bleecker Street. There is the possibility that the painting does depict Charles’ and Elizabeth’s first residence at No. 11 Bleecker Street. Perhaps the Culberts' last tenants were the Sturges family. On September 4, 1864 young J. T. Sturges was drafted into service of the Union Army. William Culbert, a doctor, sold No. 11 Bleecker to Ludwig Anger two years later, in 1866. A Prussian immigrant, Anger had the building updated by raising the roof to a full three stories and adding trendy Italianate elements. While the Angers lived in the house; the renovation included rented rooms in the upper stories. The neighborhood was already seeing the influx of immigrants and commerce--making it far grittier than it had been when respected physicians had lived at No. 11 Bleecker. Although Ludwig Anger was gone from the building in 1880; the family retained possession. Judge Bischoff’s decision finally came and no doubt was unwelcome news to the Florence Crittenden Mission. On July 1895 the Real Estate Record & Builders’ Guide listed Samuel Deutsch’s saloon and restaurant as operating here. While Deutsch served lager and beer downstairs, families continued to live upstairs. In August 1895 four children living here set out to aid The World’s Sick Babies Fund. Moe and Tillie Manisof, ages 11 and 9 respectively; and Kattie Rosenberg, 6 years old, and her 3-year old sister Fannie set up business at the corner of Bowery and Bleecker streets. The philanthropic urchins sent a letter to the newspaper which appeared on August 20. Another tenant was Augusta Lagrand. The following summer she traveled to Brooklyn to visit her married daughter at No. 232 Henry Street. There, on August 11, 1896, the 53-year old woman died of the insufferable heat. By 1897 the Record & Guide listed the Manisof children’s mother, Rosa, as the proprietor of the saloon formerly run by Samuel Deutsch. It would remain in her name at least until 1902 when a notorious gangster, Abraham Kutner, took over the operation. On March 11 several men came into the Bleecker Street saloon and told Kutner that Bennett had “put up a job” to have a fight take place the day before, which led to Kutner’s arrest. The Tribune reported that the men “worked upon Kutner until he became enraged.” The saloon-keeper stormed out of his bar and heeded to Hatch’s Saloon, at No. 311 Bowery, where Bennett worked. Among the new tenants were Henry Kalb and Abraham Goldsmith who ran Kalb & Goldsmith. Listed as “dealers in fur skins,” they were in financial difficulty by 1908 when a petition in bankruptcy was filed against them. Nevertheless, the company was still operating here a year later, now with Charles Kalb as a partner. At the same time the Fur Dealers Directory listed Londner & Birnberg in the building. Following the Angers’ sale of the property in 1914, the property underwent a relatively rapid succession of owners. Finally, in 1923, Benjamin Trachtenberg of Trachtenberg & Sons, purchased the building and held it for more than a decade. In 1931 the owners initiated a formal conversion of the property to factory and store space, including law-required fire escapes. Apparel related firms, like the S. S. Hat Frame Co., here, in 1918, continued to lease space. As the 20th century progressed, the little buildings along Bleecker Street suffered neglect. But the revival of the area known as Noho resulted in renewed interest. In 2004 the upper floors were converted to a single triplex apartment and today the ground floor—where gangster Abraham Kutner ran a saloon—is home to an organic Italian vegetarian restaurant. Great post. Do you have any idea of what the original facade and floor plan would have been? The Carter portrait is most intriguing as well. The Carters are posed in front of a window that appears to be four panes wide, so we must assume (if the portrait's background is indeed 11 Bleeker) that the drawing room window was at least double the width of the house's remaining windows. The scene outside the window is puzzling though, if the interior depicted is indeed 11 Bleeker; it seems too bucolic for a City Street, and too expansive to have been a conventional NYCity back yard. Of course, it could also be "poetic license" on the part of the artist. My guess, though, is that the portrait depicts another interior, perhaps a country house of the Carters. What do you think? I think the window and the view are a Victorian romanticism. I doubt that the window is an accurate depiction at all--notice the absurd proportions when compared to the sitters. I have studied that painting ad nauseum and cannot come to a conclusion. I wouldn't mind having it hanging on my wall, though!